Plague of Toads is a Primary Witch Doctor skill unlocked at level 11, which summons a pack of poisonous toads who hop erratically forward, exploding when they collide with enemies. The toads only travel about 30 yards in total before bursting, so this skill is not viable against enemies at a distance. The Witch Doctor sends forth toads that hop into enemies, exploding in an acidic blast. See the Plague of Toads rune effects page for a more thorough description of rune effects, or any of the individual rune pages for numbers, screenshots, blue quotes, and much more. The toads behave much like the Wizard's Shock Pulse bolts, scattering out from the Witch Doctor and spreading out semi-randomly. The accuracy of this skill with just one cast is suspect. It's best spammed, cast six or eight times in rapid succession against a large number of attackers, especially if the enemies are large or are moving around erratically, which makes them more likely to encounter multiple toads from each cast. Runestones can change this strategy, of course. Plague of Toads were great fun to use too, though less damaging than Firebats. At level 1 (the only level possible for active spells in the Blizzcon demo) the WD tossed out three toads, which then hopped forward like scaly, slimy, living Charged Bolts. They weren’t entirely mindless—they homed in on enemies, and exploded with a splat of green acid (poison) when they hit a target. If there was no target in range, the toads would hop 3 or 4 times, covering maybe half the visible screen, before bursting in air. They left behind splats of acid on the ground that would damage enemies who stood in it. While the looks were upgraded, their function had been lessened a bit. The toads are stupider, more like the amphibian Charged Bolts they sort of resemble. They no longer home in on targets, and very seldom do you hit a normal target with more than one toad from the same cast. That might be less true at higher levels (or with the multi-strike rune socketed), as you gain more toads. 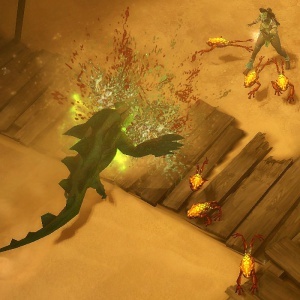 Plague of Toads was available in the BlizzCon 2010 gameplay demo as a Tier 1 skill in the new tree-less system, but it wasn't one of the Witch Doctor's starting skills. Skill tiers were removed for the July 2011 Press Event, and Plague of Toads became a level 2 skill. This skill might have more utility later in the game than in the beta, since the monsters are so weak early on that one or two toads is usually enough to finish them off. If the enemies took more damage, a Witch Doctor could stand back and cast up 10 or 12 rows of these guys, sending them hopping into the enemies in devastating waves of splattering goo. The biggest drawback to that approach is that the toads advance slowly and don’t go that far before they splat, whether they find a target or not. The skill system was once again overhauled for the Beta Patch 13 in February 2012, and Plague of Toads was classified as a Secondary skill and moved up to level 5. For Beta Patch 15, it was re-classified as a primary skill, bumped up to level 11, and had its mana cost increased. See the Witch Doctor skill archive for more details on previous versions of Plague of Toads and other Witch Doctor skills. Toads on a Dune Thresher. A Beast feeling the explosive nature of toads. This page was last edited on 15 April 2015, at 14:54.